Welcome to Peabiddies: an invitation to discover uncover & celebrate everyday beauty, awe and wonder. Join me today for something a little bit different. 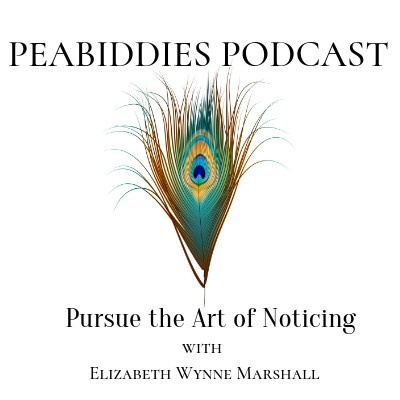 I'm your host Elizabeth Wynne Marshall and you've joined me for Peabiddies: Pursue the Art of Noticing. I'm so glad you're here. Part Two of my two part series, an interview with Libby John of Art and Faith Conversations Podcast. Join me for Part One of a two-part series with my guest Libby John. Libby is a creative artist of many forms. As a singer/songwriter, she debuted her first EP in 2016 and released her first full length album in October 2017. Along with music, Libby is also a choreographer and does freelance work for local universities and high school musicals and also teaches hip hop and modern dance classes. She has a passion to spur others on to be an influence on the culture through their faith & artistry which led her to creating and hosting the podcast "Art & Faith Conversations" in 2017. Libby can be found blogging at www.libbyjohnartandsong.org where she shares more of her creative journeyed prayerful devotions. Libby is a runner, a coffee snob, a lover of small beginnings and finding beauty in the ordinary. She lives in St. Paul, Minnesota with her husband and their 3 daughters ages 13, 10 & 7 and Dakota, their havanese pup. Let's pursue the art of noticing & becoming more present in the NOW. Visit Elizabeth W. Marshall.com to subscribe to Peabiddies Notebook, a free subscriber based newsletter which slips quietly into subscribers' inboxes. Or visit me at Peabiddies Notebook and sign up. You won't want to miss an issue. And one of my favorite places to hang out is Instagram. Find me there at Elizabeth Wynne Marshall. 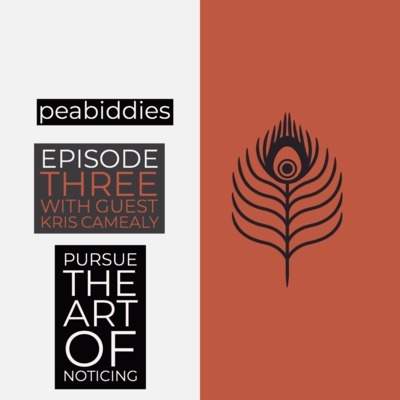 And be sure to use the hashtag #peabiddiesnotebooknotes to share the beauty you're discovering in you daily pursuit of noticing the beauty, awe, and wonder. An interview with author Kimberly Coyle. To find out more about the writing of Kimberly Coyle, please visit Kimberly at her website www.kimberlyanncoyle.com. And follow her on Instagram @kacoyle. Join me for this new episode, Episode 4, in which we pay tribute to Pulitzer Prize winning poet Mary Oliver, explore the art of paying attention and of gazing, as well as share a story of a mother's hope and love. 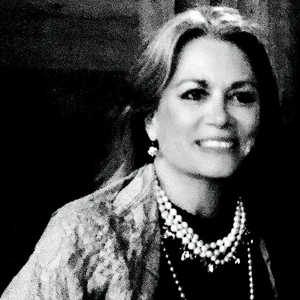 Visit www.elizabethwmarshall.com and click the podcast tab there to find detailed show notes. Please join us as we pray for Eliza. You can visit her mother, fellow podcaster, @Kayla_Craig (on Instagram) of the @UpsideDownpodcast to learn more about how you can pray for this precious family. 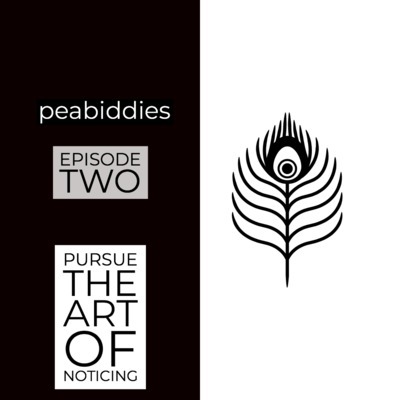 Follow us on Instagram at @peabiddiespodcast You can follow along as well at www.elizabehwmarshall.com and click the tab labeled Peabiddies Podcast: Pursue the Art of Noticing for updates, show notes and all things Peabiddies. My guest and I discuss art, her projects, our collaborative project, her restoration of an old Victorian home in historic Camden and her recent trip to Africa. And we discuss her exhibit Which is also a book available on Amazon - "All the In Between: My Life with Agnes." In which we wind down Season One, discuss some practical steps for pursuing the art of noticing in the middle of the Christmas season, and we wish you a Merry Christmas and reveal our first guest for Season Two. Episode Nine Join me as I return after a brief one week pause in my weekly podcasting schedule. Im back with a conversation with Jody Lee Collins. We discuss her latest creative endeavors and her book "Living the Season Well:Reclaiming Christmas," available on Amazon and elsewhere. Learn more about Jody at her website www.jodyleecollins.com. And find her on instagram at @jodyo52. Join me for my interview with writer, novelist, poet Tonia Peckover. Visit her website http://toniapeckover.com and follow her on instagram @_fernwood_ And join us on Instagram and use the hashtag #theartofnoticing or #takenote & tag us @peabiddiespodcast. We want to see what you are noticing. Share with us your discoveries of everyday awe and wonder. In this episode Ashley and I continue our discussion about her newly released book, Finding Holy in the Suburbs, available wherever books are sold. Join me as we chat about how she is learning to make her home and carve out a holy space within the southern California suburbs. And of course Ashley speaks to her pursuit of the art of noticing within the parameters of a full and busy wife as mother of four and pastor's wife. Ashley and her husband are involved in a church plant in Orange County where life is full. Did I mention she holds a PHD in English from the University of Edinburgh, Scotland. Join me in Episode 6 for Part One of a two-part interview where I chat with author Ashley Hales about the release of her upcoming book. Holy in the Suburbs - Living Faithfully in the Land of Too Much, published by InterVarsity Press releases October 23, 2018 and may be found wherever books are sold. A little squeaky mouse joins us earlier on (thankfully I must have shooed him away), I get tongue tied when I try to speak the word "specificity" and I literally tell my age. All of this as we learn and grow as a young podcast. Thank you for joining us as we find our wings and learn to fly here at Peabiddies. 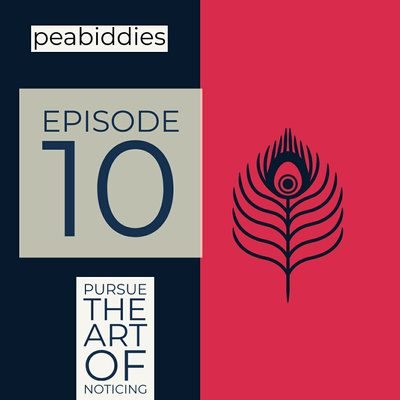 Peabiddies: Pursue the Art of Noticing: In episode five we discuss the art of noticing, of practicing presence, and of taking note. 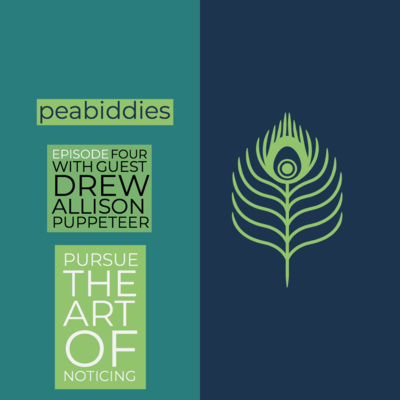 In this episode, Episode Four of Peabiddies: Pursue the Art of Noticing, I chat with puppeteer Drew Allison, founder of Grey Seal puppets. Join me as we look through the lens of creativity through the eyes of this artist, one who has spent 30 years dedicated to his craft.